Ahead of some tour dates behind Solids' just-released Blame Confusion, the Montreal duo have unveiled a seriously zany animated video behind the debut LP's "Haze Away." 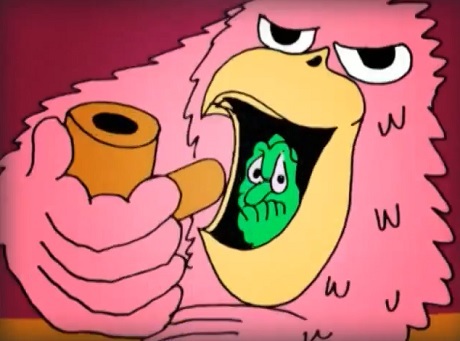 Produced by Montreal artist Étienne Nixon, the video melds the fuzzed-out alt-rock number with a jumble of wildly imaginative cartoon sequences. Seen here are a giant-sized bird of flight puffing on a pipe, an anthropomorphic car with a bunch of flats managing to criss-cross the globe (literally), one man's early morning walk that transforms him from a stock beardo to an enraged floating raisin and more. What does it mean? Who knows, but that monstrous, grinning clown figure that pops out of the sea mid-clip has us too scared to ever contemplate swimming in open waters ever again. You can check out the odd sequence of events down below. As previously reported, Solids have a tour coming up with PUPS. You'll find those dates and more down below.